How Do You Choose Between Single and Double Bevel Thresholds? When shopping for thresholds in standard type of materials such as aluminum, vinyl, and rubber, you’ll find that while the style varies, it’s basically just a strip of material that connects one type flooring to another hiding the seams. For the most part, most of thresholds are ADA compliant, which means that it won’t be an obstruction for anyone with disabilities. So when it comes to selecting the type of thresholds here, it comes down to simply deciding what kind of material you want. Now, when it comes to shopping for natural stone thresholds, the choices change. You’ll not only have to decide what kind of stone you want, but also if you need a Single or Double Bevel threshold. Because natural stone is such a dense material, the size and shape matter. While vinyl, rubber, and aluminum can be manufactured into a flat surface, natural stone cannot. Therefore, it needs to retain a certain thickness in order to keep its durability. The challenge with a natural stone threshold is keeping it’s durability while remaining ADA compliant means that it will either need to be installed properly or the contractor can select a Double Bevel for their doorways. Whatever the choice, you’ll be sure to have a beautiful doorway that will last for years. Most people who are not familiar with natural stone thresholds often get the Standard Double Bevel and Hollywood Double Bevel mixed up, thinking they’re the same thing, when in fact they’re not. If the threshold you need is to seal the end of a floor, then you’ll need a threshold that has at least one beveled edge. For thresholds that are needed to transition one type of flooring to another, then you’ll need both sides beveled. Before you start stocking your warehouse with natural stone thresholds, it’s best to do your research and learn about what kind is available to you. This way, you’ll be informed enough to make the best decision for your company. The Standard Double Bevel looks like a brick-shaped block of stone that measures approximately anywhere from 2”, 4”, ½”, 5”, and 6” wide, and up to 14” in length that stands from 3/8”, ½”, 5/8”, or ¾” in height. With all of these choices in size, even the smallest selection could go against ADA regulations if it’s not installed properly. Here again, while it’s important to consider how you install your Standard Double Bevel threshold, you must also consider where you’re going to install it. For example, if you plan to install this type of threshold in a doorway in a public dwelling, then you’ll most certainly need to adhere to ADA standards. If you’re installing this threshold as part of a bathroom, locker room, or spa design, you might have more wiggle room to install it as a water barrier to a shower stall. Here again, it’s all about how you install it. We’ll talk more about that later. The Standard Double Bevel has an eased edge to give it a smooth look and feel. It also takes away the hard edge that that can cause injuries providing safe foot traffic. The Hollywood Bevel, also known as the handicapped bevel comes in two options: Hollywood Single and Hollywood Bevel. The Hollywood Bevel is referred to as the handicapped bevel because it has a wider eased edge that looks like a mini-ramp. Builders have found this feature works perfect for wheelchairs and other rolling carts that go back and forth from one room to the next. The Hollywood Bevel somewhat mimics the look of the standard thresholds that come in vinyl, aluminum, and rubber, covering the seams between flooring with a dome-like strip. Yet, because natural stone needs to be a certain width, it can mimic the design, but it cannot compromise its 5/8” height. The Hollywood Double Bevel can be looked at as a distorted version of the Standard Double Bevel. Where the edges are eased on the Standard Double Bevel, the Hollywood Double Bevel is an exaggerated version of this. The measurements for this threshold remain the same except the incline is 1 3/8” in width on both sides. This allows for an easy transition for rolling objects that get carted from one room to another. The Single Bevel threshold is a cross between the Standard Hollywood Bevel and the Standard Double Bevel. On one side, it has the look of the Standard Double bevel with its brick-like shape, and on the other side, it has the look of the Hollywood Double Bevel. This particular type of Hollywood Bevel is perfect for end flooring. For example, entrances from the exterior to the interior would work well for the Hollywood Single Bevel. Different Ways to Install Your Natural Stone Thresholds. There are essentially two ways to install thresholds: flushed and embedded. This all depends on the type of surface the doorway is made out of as well as where it’s going to be installed, and its overall purpose. If you are planning to install a flushed threshold, the Hollywood Bevels might be the preferred type of material. Installing an embedding natural stone threshold requires a few more steps, as the threshold needs to be leveled with the floor. In this case, the floorboard will need to be cut to accommodate the height of the natural stone threshold. 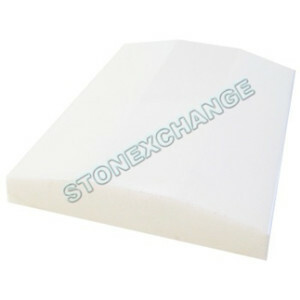 If you have more inquires about whether you ought to stock Single or Double Bevel thresholds in your warehouse, contact the Stonexchange, a manufacturer and wholesale marble threshold and window sill distributor in Miami. We have a quality selection of natural stone thresholds, window sills, soap shelves, and shower seats that you can view online. Contact us through our online form or by phone at 305-731-2400 today!